There's nothing worst than waiting for your first big, beautiful tomato to ripen – only to flip it over and find a black rotten spot on the bottom. (Black tomatoes = tasty, black bottomed tomatoes = not tasty.) 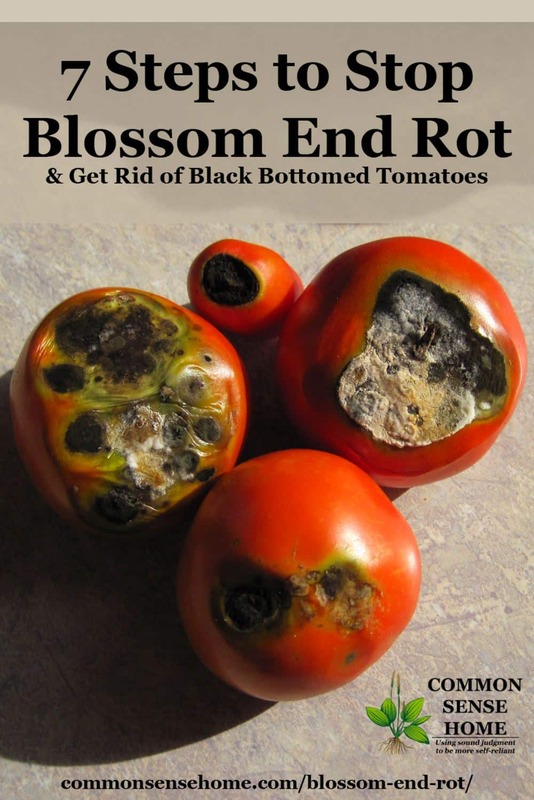 Your black bottomed tomato has blossom end rot. While annoying, blossom end rot can be treated (and potentially prevented in the future). Caught early, your odds of a successful tomato crop are still good. In this post, I'll talk about causes, prevention and control, and provide several photos to help you ID the problem. Blossom end rot is caused by the tomato plant not being able to get enough calcium to the developing fruit. It is not caused by a plant disease like a fungus or bacteria. Blossom end rot may also occur in peppers, melons, eggplants, squash and cucumbers. Moisture – Too little or too much – We've had dry conditions this summer. Even with mulch, I have lost some tomatoes to blossom end rot. Last week I heard from two different local friends who had problems with rotten, black bottoms on their tomatoes. Too much Nitrogen – Dump a load of fresh manure on your tomatoes, and you may be rewarded with lots of green growth and black bottomed fruit. The nitrogen salts may make the calcium in the soil less available to the tomatoes. Soil too Cold at Planting – More of an issue for northern gardeners, cold soil can interfere with nutrient uptake to the plant. Root damage due to cultivation – Aggressive digging around your plants (for weed control, for instance) may damage the roots. This would also interfere with nutrient uptake. Susceptible varieties – Certain tomatoes varieties are more prone to blossom end rot than others. Note how you can see damage deep into this badly affected tomato. Prevention and control are where you need to focus to salvage the rest of your tomato season. 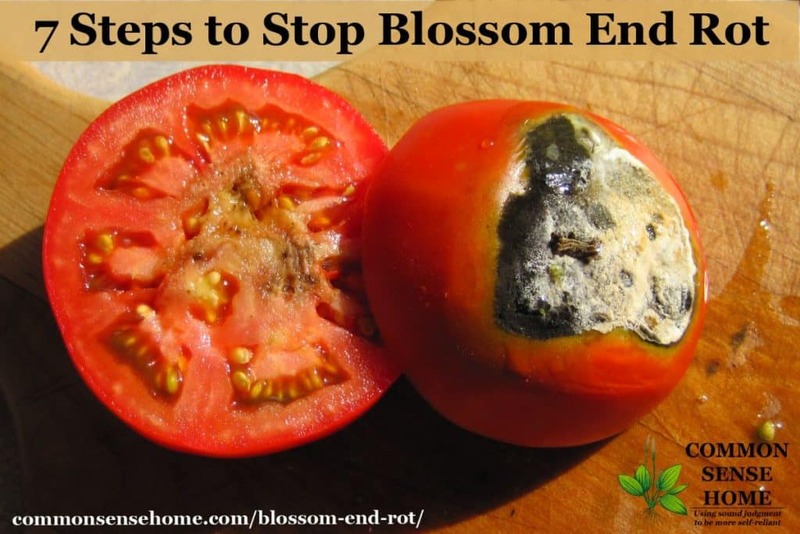 Here are steps you can take to limit and control blossom end rot on tomatoes and other crops. 1. Maintain steady levels of moisture to your plants. Pot grown plants in particular may be more prone to blossom end rot due to difficulty keeping the soil moist enough. Try self-watering containers or watering spikes in your container. 2. Use a Balanced Fertilizer. Aged manure or compost is great, as tomatoes are heavy feeders – just don't use too much fresh stuff. There are also good organic fertilizers available to help give your plants a jump start. For detailed planting instructions, see “How to Grow Tomatoes Organically“. 3. Make sure your soil is warm enough, but not too hot. Tomato seeds need soil temps of at least 60°F (15.6°C) to germinate. Transplants can go into soil above 55°F (13°C), but growth will be slow. A general rule of thumb is to wait for nighttime temperatures to be above 55°F. You can easily test your soil temps with a soil thermometer. To raise soil temperature, you can cover your planting area with black or red plastic – or be patient. In summer heat, organic mulch can keep roots from overheating. 4. Avoid working too close to the roots of the tomato plant. Pull weeds when you need to, but don't attack the ground close to the tomato with your hoe. Mulching helps limit the need for cultivation. 5. Check your soil pH before planting. 6. Add calcium to your soil. I work in crushed eggshells at planting time. A handful of garden lime will also work. You can also work a handful of lime gently into the soil surface, cover with mulch, and water well. There are also rot stop sprays that can be applied to the tomato foliage. 7. Choose varieties that are less susceptible to blossom end rot. This is a little tricky, and is a good reason to keep a garden journal. I've seen in my own garden that some varieties are much more likely to develop rot than others. In my garden this year, those varieties more prone to blossom end rot included San Marzano, Orange Banana and Better Boy. Meanwhile, the rest of the crop was largely unaffected. Amish Paste, Opalka, Blue Beauty, Stupice, Glacier, Black Cherry, Mortgage Lifter, Arkansas Traveler, Tigerella were among those without a problem. I'd love to hear your experience with which varieties are more or less prone to be affected in your area. If I missed any tips that work for you, or if you have any questions, please share those, too. Good luck. We’re in the same boat. The plants just aren’t producing like they should, even the ones without blossom end rot. One patch has been soaker hosed, and I think I’m going to get more hose. How do you do it? Maintain a homestead and family, write books, blog… I am really impressed. Truly. And I am so grateful you are willing to share your knowledge. Thank you! I’ll be honest – many days are pretty messy and long, and I don’t get nearly as much done as I would like. For instance – I *thought* I’d have my first print book done several months ago. Instead, after writing, editing, adding additional recipes, taking new photos, getting the first proof back and hating it, here we are months later, getting ready to submit a completely updated color version to order a proof. Fingers crossed that this one turns out like I envisioned it. The boys are getting older now, and are a huge help around the place. I want them to know how to do what I do, so they can pass it on to their families, since the odds are that their spouses won’t have the same type of background. Of course, with them getting older, it also means that they may move on to pursue other interests. The eldest will likely be a tech guy like his dad, but the younger fellow thinks he wants to make a go of making a living off the land, so we’re planning and planting to make that happen. Sometimes I’m exhausted and ready to quit. Then I take a walk and wiggle my toes in the grass, sample a tomato fresh off the vine, still damp with morning dew, take a look around at the amazing diversity of what we’ve created out of what was once nothing by grass, and I feel rejuvenated. Or I pop online and see a message from a reader who “gets it”, and it makes it worthwhile. In other words: you’re human! Thank God! I am so grateful for your work and for sharing it with us. Thank you! Thank you for your kind words, Anne. Great post! I add crushed eggshells to the soil around my tomato plants, and use chicken manure compost. So far so good! You have some great tips in this article. Hi Lisa! Nice to see you “visiting the garden”. I find my biggest factor here is really the moisture. We’re having one of those years (again) where the rain goes south, north or just evaporates before it reaches here. Yesterday I installed soaker hose through my main patch (20 plants), and we’ve started hand watering the other 30, which are spread all over the rest of the garden. Time to buy more soaker hose. It was my understanding that the magnesium helps with blossom set, i.e., getting the fruit to form, but I haven’t seen anything indicating that it helps with blossom end rot. Has your experience been different? You are correct. Laurie, magnesium sulfate won’t help prevent BER. Foliar sprays won’t help. either. Eggshells should be powdered then mixed with vinegar (raw ACV is best) until the fizzing stops. One tablespoon of that mix dissolved in a gallon of water will travel from the soil up the xylem and to the fruits, preventing most BER. Could you provide more specifics about your formula with egg shells and ACV? Ratio of shells to ACV? How many times do I water with this mixture…once or regularly? That is exactly what I do. My first year in the garden was absolutely horrible. Had blossom end rot consistently and could not stop it. Then I read about epson salts. Now in the spring when I plant my plant I dump a handful of epson salt in the plant hole. And then in the summer when plants start to bloom I sprinkle a a little over the roots. I have not had a problem since. This will be the 4th year. I have my first crop of tomatoes in 4 years thanks to Actinovate for fungus. I have tomatoes in a friend’s garden–I don’t think this is the year for good tomato crops. Too dry in some areas, too wet in others, too hot in some. In my garden, the Roma tomatoes seem to be having the most problems with blossom end rot. Thinking I’ll try Amish paste next year instead. We tried Amish Paste this year and same problem. All paste-type or roma-type we’ve tried have been bad, as have Aurega, a gorgeous small, sweet orange tomato. It’s definitely a variety issue with us, because we have a lot of success with other types. We had these problems. 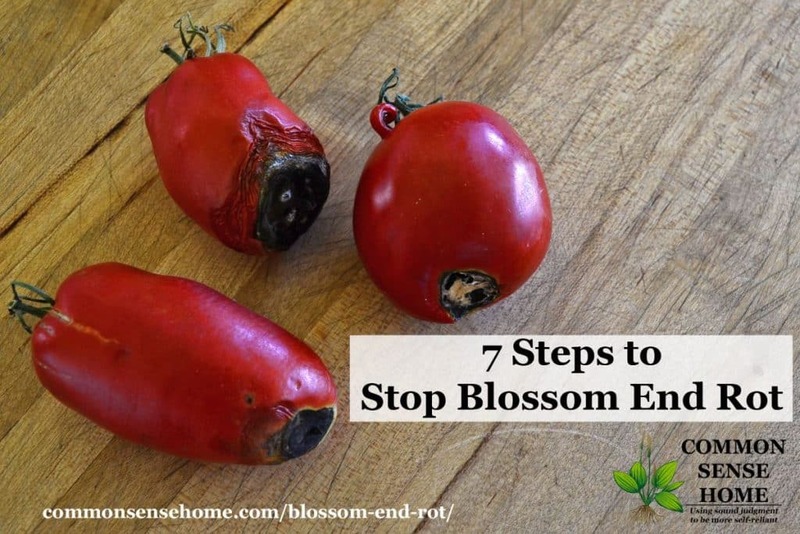 It would be step #8 to stop blossom end rot, and more importantly black bottomed tomatoes. In our situation it is because we grow out ‘maters in ‘tainers. The treatment was to use a root and soil conditioner. This is a 9-0-0 fertilizer with 5% calcium. Plants are fed 3 times over a 8 day period. Lisa (above) mentioned eggshells which would have calcium, but I don’t know how long it would take for the Ca in the eggshells to be available for the plants. Laurie, as for your comment above about heat and wet or dry…. There are four things you can talk to any gardener about, too hot, too cold, too wet, and too dry. That’ll cover it. Thanks for a great article. My boss just texted me a picture to me what this is. I sent him your comprehensive article. My San Marzano tomatoes have definitely had the most troubles this year. First and last time I’ll grow them. The others have been fine. Thanks for sharing your experience, Mari, and for sharing the post. First time growing San Marzanos……and the first time I’ve had blossom end rot. Doesn’t help that it’s in a container. Hopefully I can save it this year, then next year, I’ll make sure to put it in the raised bed. I stopped growing San Marzanos because while they are extremely prolific, they are also extremely prone to blossom end rot. I much prefer Amish Paste, Opalka, and Orange Banana paste tomatoes. Back in the 40s, Dr. William Albrecht did a great deal of research on soil minerals. He found that most soils have enough calcium, but need a release agent to free the calcium. That would be boron, found in 20 Mule Team Borax. One part boron to 1,000 parts calcium seems to be the proper formula, according to Dr. Albrecht. A professional soil test, typically available from Land-Grant universities, will show the current calcium to boron ratio. Google “Dr. Albrecht” to find how to apply the calcium/boron formula. Unless you garden in Death Valley, where boron is mined, your soil probably needs some boron. Thanks for the note, Daryle. I started googling, but coming up with the right info is elusive at this point. Lots of more general info on Dr. Albrecht’s work, but very few specifics on how to apply it. I’ve heard of him before, but haven’t read his work. I think a thriving mycorrhizal population in the soil would also serve to unlock available minerals. A couple of things you might want to try: Google “Dr. Cho” late of Korea, now living in Hawai’i. He is, or his father was, the expert in IMO. It’s what Korean natural agriculture harvests as indigenous micro organisms … what we call mycorrhizal populations. I make a fair amount of lactic acid bacteria from rice and milk. I turned some loose on cucumbers a year ago, with the leaves growing to 10 inches across. The other source that may help is SoilMinerals.com. These folks are Dr. Albrecht proponents offering quite a bit of information, but one monograph tells about Boron from 20 Mule Team Borax (it’s about 10 % boron) in particular. Interesting. I’ll have to add that material to my ever growing reading list. Did you see the Mycorrhizal Planet book review (https://commonsensehome.com/mycorrhizal-planet/)? Lots of myco info, but nothing specifically on rice grown cultures. Of course, the author of Mycorrhizal Planet runs a biodynamic apple orchard, so different frame of reference. We inoculated some of the garden and trees this year, and have been using more ocean and fish products and ground minerals. I know I’m a little low on boron here, because my broccoli sometimes have hollow stems, which is another red flag. It looks like a good book. I have a first edition of ‘Mycelium Running’ by Paul Stamets, who founded Fungi Perfecti. There is an article on how to use rice to grow lactic acid bacteria (mycorrhizal soil activators). I used some LAB on a tomato plant that produced a 42-inch root stock. The article tells how to start and grow the LAB from one cup of rice. It’s a fairly good article … I wrote it. Paul’s book is another one I need to read. I’ve watched his TED talk, and read some of his articles, but not his book – yet. The LAB approach sounds practical. Michael’s book was often more focused on what the mycorrizhal fungi were doing, and how to encourage the spread of introduced strains, but little info on jump starting your local strains. This year has be the exception for root rot, non producing runaway vines. GREW my own plants from seed. Planted nothing but Beef Steak variety. Dug 2 ft hole with post hoe digger, dropped in fish parts, a hand full of rice hulls from local chicken house clean out, filled hole with water then covered back with dirt. One week later planted my 10 inch tall tomato sets. Mulched with straw and put my rolled rebar fence tomato cages up same day. Watered everyday for a week and never touched plants again till harvest. Results: six foot tall, large stem dark green plants that are constantly producing the best sized, best looking tomatoes I have ever grown. Took 3 dozen to our church produce give-a-way, and they we the talk of the event. Think I’ll do it again!! Sounds like you found a winning combination! I though lime is used to neutralize soil and make it less alkaline . So would that not reduce the ph level of the soil? Lime is used to neutralize soil, yes, but it’s added to acidic soil to make it more alkaline, raising the pH of the soil. The pH of hydrated lime for industrial use is around 12.4, and agricultural lime would have a similar pH range – highly alkaline. How much ACV to powdered egg shell? Dr Cho puts the powdered egg shells in a large container due to the possibility of lots of foamy reaction. Keep adding small amounts of ACV until the fizzy reaction stops. Add one tablespoon of this mix to one gallon of water. Pouring the water mix directly into the soil around the tomato works better. Keep the plant well hydrated. Thanks Daryle. I have one more question…do I use the egg shell/vinegar mixture to water all summer long or just one time? I’m new to gardening and this is my first time trying a tomato plant. Someone told me to put compost in the soil so I bought Miracle Gro Natures Care Really Good Compost. Could I have put too much in which resulted in calcium deficiency? Minerals in the soil, “plant food”, are held by adsorption. Think static cling. Clay and organic material hold minerals such as calcium, magnesium, potassium and sodium. Rain can wash off clinging minerals … so I usually add the calcium mix when watering right through the season. Just put less mix into the water as the tomatoes grow bigger. Test the pH of the soil to maintain a good level (6.4). I use alot of Eastern red cedar lumber of which I plane down. Can I use the shavings for mulch in my container tomatoes and other vegetables? You can, but you might run into some trouble if you do. In some cases, cedar causes contact dermatitis with repeated exposure. (I don’t know how much, if at all, you’ll be touching the mulch.) Cedar can also ward off beneficial insects along with problem insects. If mixed into the soil, cedar can tie up nitrogen, inhibiting plant growth. You may want to experiment with a light layer around some plants and see if you note any negative effects. Stupice struggled for me in 2016, too. If I remember correctly, I think they were also hit with septoria leaf spot as well, much harder than most of the other plants. That summer was cool and very dry. We laid down soaker hoses in the patch, but it wasn’t the same as a good rain. I have 6 early girl plants, three of which I planted up in Northport Michigan on the shore of lake Michigan’s Traverse Bay in very sandy soil. It is what they sell for “topsoil” up here but that the locals call “topsand”, that is sold by excavating companies – they remove it to build homes, and sieve it and resell it but a lot of sand comes along for the ride. I bought it for the entire garden area but dug 18″ down for the three tomatoes and added some miracle grow potting mix, some peat moss, and a sprinkle of granular fertilizer (10-10-10). I have blossom end rot on every tomato so far. I have a sprinkler that runs 35 minutes every two days. Had better luck last year but did not use the potting mix. I shifted the position of the three tomatoes about 18 inches so they are planted half way between where they were last year – last year was the first year grown there in the new garden area. Now the other three are planted in a raised bed in East Lansing, MI where soil is a lot richer (far from any lake shore). These three have no end rot at all but this is the first year I have planted tomatoes in that raised bed. Some how you have to keep putting tomatoes in new places so they are not in the same soil two years in a row – better three years before going back to the same spot they were previously planted or so I have believed. But that may not be about blossom end rot but about preventing other diseases. Most of what I see regarding tomato planting recommends the rotation schedule you suggest, largely for disease prevention, as you note. That said, I’ve also seen references that swing to the opposite extreme, saying that tomatoes love to live in the same spot and even thrive on compost made from tomato plants. Commercial greenhouses, even some organic ones, grow tomatoes in the same space year after year, because that’s the space they have dedicated to that crop. You work with what you have available. For the sandy soil, I’d highly recommend more organic matter to build up its ability to hold moisture, specifically compost or well rotted manure worked into the soil, along with organic mulch on top that will rot into the soil over time. Keep an eye open for diseases, but if you need to plant in the same spot without a three year gap, don’t worry about it. Just monitor plant health and adjust accordingly. You can add elements like Effective Microorganisms or compost tea foliar sprays to help populate leaf surfaces and soil with good microbes for extra protection if you like, but the best defense is to look to the health of the soil and plants, and ensure regular deep, even watering. Last year grew Brandywine which yielded 9 lbs per plant and had 20% blossom end rot. This year planted Early Girl, Campbells and Manitoba which yielded 20 lbs per plant and ZERO blossom end rot. What I did different is when planting I took one gallon ice cream buckets and cut a 4 inch hole in the bottom. I dug a sizable hole in the garden and put the roots of the seedlings through the hole in the bucket, then planted the bucket in the ground to about half of its height, packing dirt around the bucket. I added a handful of Miracle Gro / with calcium to each. Then I simply watered each plant each day by filling up the bucket. I did no foliage spraying. We had a dry hot summer, max 34 degrees Celcius. I started from seed in the third week of February. We live in Red Deer, Alberta. I believe the consistent watering made the difference. 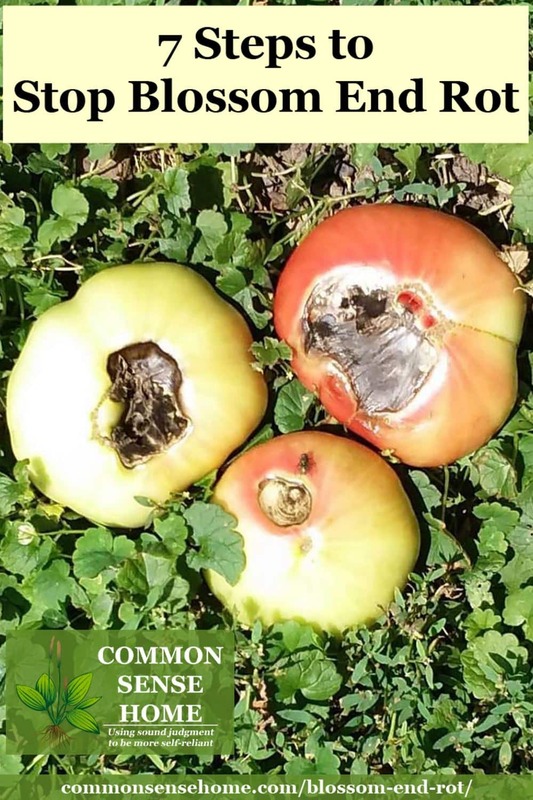 Do you know much about Bacterial wilt in tomatoes? My large area raised bed has this problem. Tomatoes wilt from top overnight when about 4 ft tall. . So sad. Why does nobody find A CURE for this terrible scourge? Thankfully this isn’t a problem I’ve faced in my garden, but I know how frustrating it is when plants fail to thrive. We had late blight go through back in 2010 and wipe out much of the crop. For us, winter cold clears out some problem microbes – like the late blight fungi. You didn’t mention where you were at, but solarizing the soil is another possibility to drop levels of problem organisms. You wet the area down (before planting) and cover with clear plastic for several sunny days. Specific tomato varieties may be more resistant to the type of bacterial wilt that you face, so that’s worth looking into as well. You may also want to check out some non-conventional ways of boosting your tomato plants immune systems, like microbial inoculations, playing classical music (only early in the morning) and foliar feeds. I touch on these in the article about growing tomatoes organically https://commonsensehome.com/grow-tomatoes-organically/2/. It may sound a little nuts, but as I’ve gotten older, I focus more on building vibrant health than “curing” anything. There will always be threats to the garden. The more we can build a healthy, abundant ecosystem, the better plants are able to overcome these problems.